Six months before the 2019 midterm elections, CNN Philippines has announced the first of what is expected be a series of fora and specials aimed at helping the electorate make informed decisions come May 13. 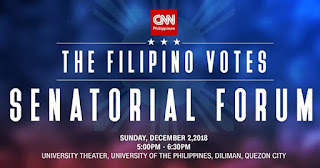 On Sunday, December 2, the local CNN station will be hosting a senatorial forum which will feature some of the candidates running for next year's Senate race. Slated to appear are the following: Rep. Gary Alejano of the Magdalo party-list group, former PNP chief Ronald "Bato" Dela Rosa, former MMDA chairman Francis Tolentino, human rights lawyer Atty. Chel Diokno, former senators Serge Osmeña and Juan Ponce Enrile, and re-electionists Bam Aquino and JV Ejercito. The forum, billed as The Filipino Votes: Senatorial Forum, will be moderated by the tandem of Pia Hontiveros and Pinky Webb. It will air live this Sunday at 5PM on free TV and online via CNN Philippines' Facebook page. Get to know some of your senatorial bets during our #TheFilipinoVotes forum on Sunday. What do you want to ask them?